Welcome to the Freeola Internet customer support pages. This guide is designed to help with setting up a Freeola email address﻿ on Microsoft Outlook 2016 for Mac OS X﻿. For more internet help topics please visit our main Support Page. 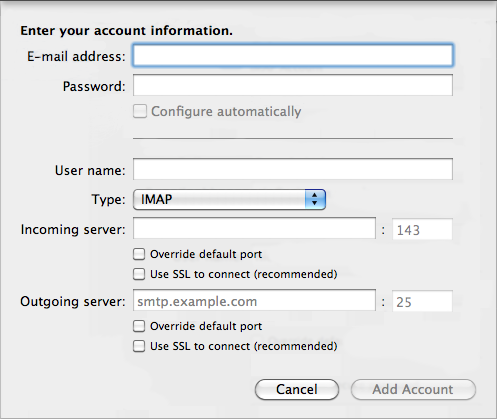 1, What protocol your e-mail address is set up to use (IMAP or POP3). 2, What service is assigned to your e-mail address (EmailPro, Free Email or One Address). Load Microsoft Office Outlook﻿ on your Mac. Click Tools in the menu bar at the top of the screen and select Accounts. You should be shown a list of currently configured email accounts. Click the + (plus) icon in the bottom left of the screen and select Other E-mail. E-mail Address: The email address that you are setting up. Password: The email password as listed in your MyFreeola account. User name: Your full email address. 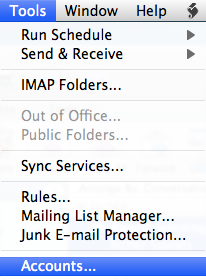 Type: This should be set to POP or IMAP depending on what the access technology is set to in your MyFreeola account. 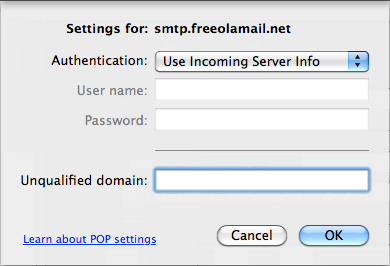 Incoming server: This will take the form of yourdomainname.freeolamail.net where 'yourdomainname' is your domain name with any dots ( . ) replaced with hyphens ( - )﻿.﻿﻿ For example, if your domain name was freeola.co.uk, the incoming mail server would be freeola-co-uk.freeolamail.net. Use SSL to connect should be ticked. The remaining settings should be left as default. Click Add Account to continue. You will now be taken back to the accounts page and should see that the information that was entered in the previous step has been added. There is an additional step required to configure the outgoing mail server correctly. Click More Options on the account settings page to continue. From the Authentication drop-down menu, select Password. You will now need to enter the User name and Password as above. The Unqualified domain field should be left blank. Click OK to save the changes. Your Outlook email client is now configured to send and receive email messages.